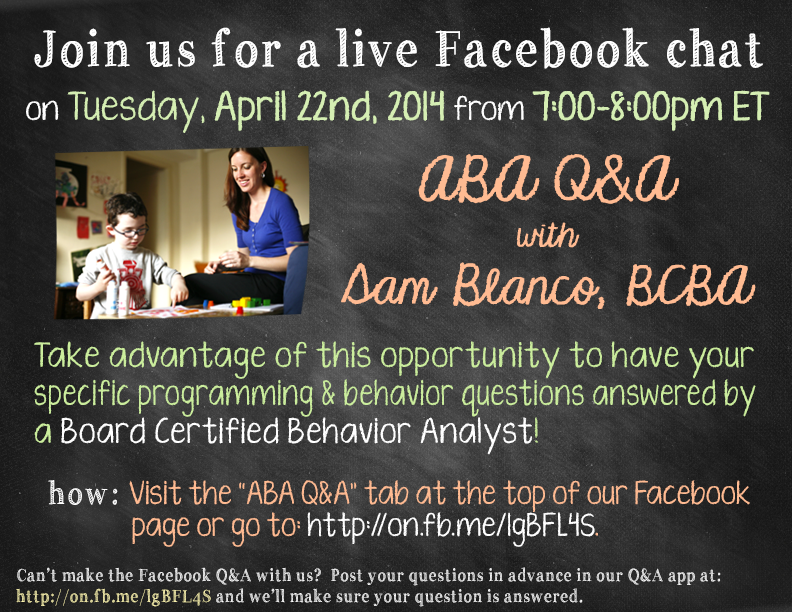 Join us for a live ABA Q&A with Sam Blanco, BCBA TONIGHT from 7:00 to 8:00pm ET! Our primary focus will be on Managing Difficult Behaviors. Here is a chance to get your specific questions answered in real time by a Board Certified Behavior Analyst. Just visit our Facebook page and post your question here. For details of the Q&A, visit the event page here. If you can’t make the live Q&A with us on tonight, you can post your questions in advance, and we’ll make sure your questions are answered. Don’t forget to check back to the app for Sam’s answer! Different Roads to Learning reserves the right to remove or delete any questions and comments deemed to be of an inappropriate, offensive, and discriminatory nature. All answers are intended as suggestions only. Programming decisions and interventions should always be discussed with trained professionals prior to implementation. All programs should be individualized for a particular child or student and overseen by a qualified behavior analyst. Written by: Different Roads to Learning on April 22, 2014. This entry was posted in ABA, autism, Autism Awareness, Behavior, Q&A and tagged ABA Q&A, behavior management, Sam Blanco BCBA, special education by Different Roads to Learning. Bookmark the permalink.